Apple pie. An American tradition. This one is not too hard to convert to Top 8 free. The filling is already mostly safe (just had to convert flour to gluten-free flour), so I just had to tweak the crust a bit. I have had trouble making the crust so it is easy to transfer. Last year the crust I made for a pumpkin pie came apart as I tried to roll it over my rolling pin to transfer. 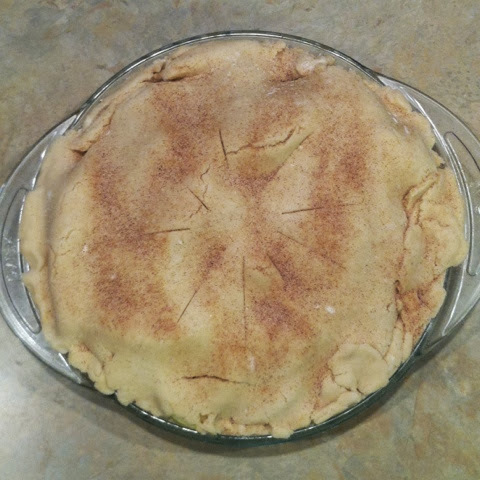 So I cut it into pieces and placed it in my pie dish, then patted it together like play-doh. This year I changed the recipe a bit to make it more moist. It definitely tastes better, but it is still difficult to transfer. I resorted to using a cake lifter which made a world of a difference. It is important to get some gluten-free to stick to the cake lifter to make the transfer as easy as possible. Using a pastry blender, cut shortening into flour. Mix in applesauce, salt, and vanilla. Add water 1 tablespoon at a time until dough reaches desired consistency. Split dough in half and roll into 2 balls. Wrap in plastic wrap, and refrigerate while making filling. 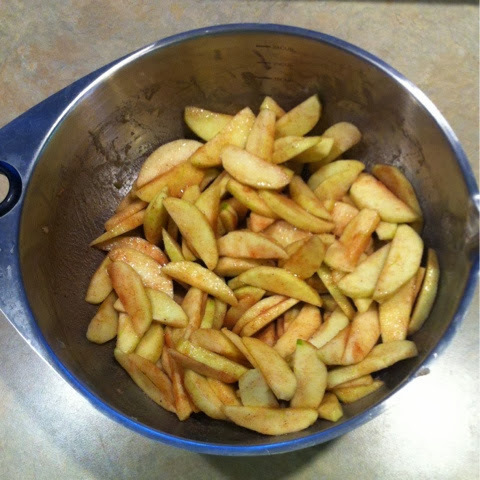 As you are peeling and cutting apples, use small amounts of lemon juice to coat apples to avoid browning. In a separate bowl, combine flour, sugar, cinnamon, and nutmeg. Coat apples with this mixture. Preheat oven to 375º. On a (gluten-free) floured surface, roll out one ball of pie dough into a circle big enough to fit your pie plate. 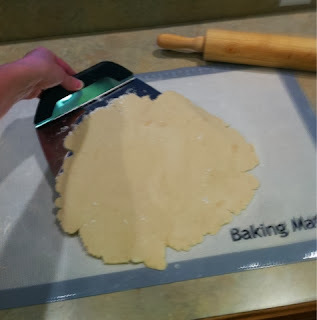 Tranfser crust to pie dish and remove excess dough from edges. 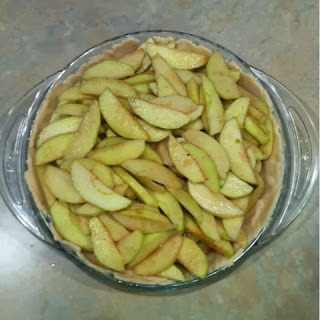 Pour apple mixture on top of crust. Roll out remaining dough and carefully place on top of apple mixture. Cut a few slits in top crust for ventilation. 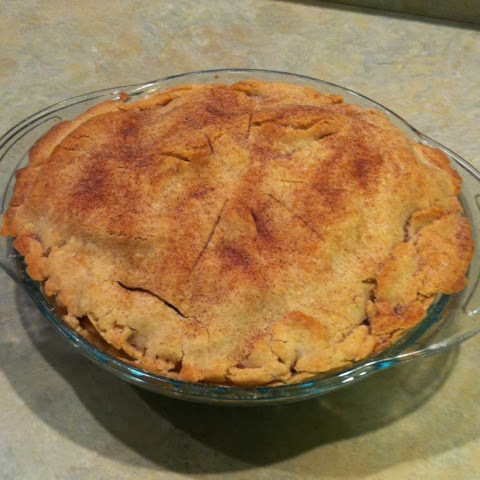 Another option would be to cut out seasonal shapes from dough to place on top of pie rather than a full circle. Check out some cute ideas on Keeley McGuire's Blog such as stars or leaves. Sprinkle cinnamon sugar over top of crust. 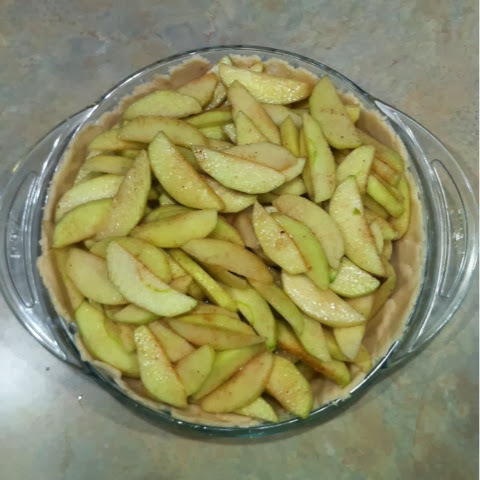 Cover edges with foil or a pie shield and bake for 25 minutes. Remove foil/shield and bake an additional 25 minutes. Remove from oven and allow to cool.